Nice and heavy. I like the quality. It’s soft too! It’s more of a shag than the picture shows. If you buy this blanket don’t use softener when you wash it. The 'Are You Kidding' Blanket combines two blankets into one. One side has thick strands of wild plush that you will love to run your hands through while on the other side you will find thick, ultra-soft microfiber fleece. Turn your bed into a comfortable oasis with the 'Are You Kidding' Blanket. Dimensions See DetailsFull: 80" x 86"Queen: 88" x 98"King: 104" x 98"
I changed the color scheme in my bedroom and this mint color is gorgeous and perfect. This blanket is incredibly soft and fuzzy and warm. To me, it is just the right thickness, not too heavy. Very good quality at an excellent price. Love love love this blanket. Super soft and cozy. The kids and dogs will try to have when I'm snuggled with it on the sofa but I got the bigger one to share. Washes well...no shedding. Love this throw I got to go in my granddaughter's room at my house. I decided to give her room a make over, she has not seen it yet because she lives in another state. The only reason I didn't give this a five star is because of the price. I saw these blanks on so many other sites for much cheaper prices. My reason for not ordering from some place else is the color, they did not have the mint green color that I needed. Again very soft over sized just love it.... just not the price. Sooooooo soft. Using as my comforter on my king bed and looks fantastic! Warm, soft, warm, soft, warm, soft. Need I say more. No shedding, just pure comfort. Best blanket I have ever had!! So soft and fluffy!! Cute on my daughters bed as a throw! Love, Love, Love this blanket!!! It is super soft and super easy to wash and dry. It is really more of a year around blanket. It is light enough in weight that I used it in the warm months when chilled and it is cozy and warm enough to use in the cold months as well. EXTREMELY COZY!!! Love, love, love this blanket! I bought the grey blanket. Seems very nice so far. Nothing fancy. Haven't noticed any shedding, which was my main concern. 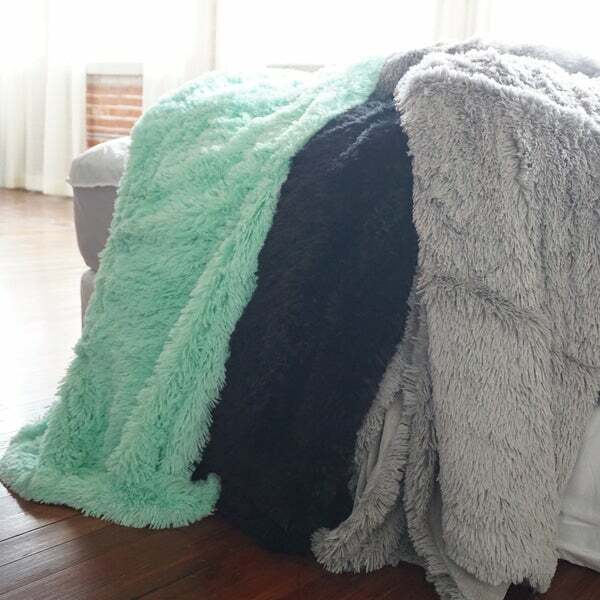 So many "fuzzy" blankets shed terribly. I took a star off because the blanket arrived VERY wet inside of a completely dry box (and outer plastic packaging). How does that even happen?! All I can say is, I hope that was just water. Kinda bizarre and gross. I washed it twice to be safe. I also reached out to Overstock and they didn't do anything. Very disappointing. Very fun and funky blanket. This is great for any teenagers bedroom or dorm room. Easy to clean, just drop in the washer and can put in the dryer. Blanket is fantastic - lightweight, yet warm! The only reason why I didn’t give it 5 stars is because the King size width doesn’t allow for a lot of overhang - enough to keep you covered, but not a lot of extra! Out of the box it did shed a small amount but after washing it no longer had that issue. It’s very soft, warm and just the right weight. I purchased a king size and it’s perfect.